Please click on the title to retrieve the news content. August 1, 2017 -- Starting from FirstSpot v8.1.101, FirstSpot now supports Live Update through our web-based Configuration Manager. As we switch to a software-as-a-service model, FirstSpot will be continuously updated and maintenance customers will enjoy a more timely update in response to the dynamic network environment and customer feedback. You can check out the new v8 version log for more details. July 4, 2014 -- We are pleased to announce the new FirstSpot v8 has completed the beta testing and goes gold. Firstspot v8 refines the already feature rich product by incorporating modern features like Social Network (e.g. Facebook) support, Web Filtering with Shalla Blacklists, and more. Please also check out FirstSpot® home page for the detailed product information. January 23, 2014 -- We are pleased to announce the immediately availability of the new FirstSpot v8 beta 1. In development for more than two years, FirstSpot® v8 contains enhancements based on feedback from our real life customers. FirstSpot® v8 continue to redefine the industry leading Wi-Fi hotspot experience. You can view the FirstSpot® v8 new features list here. You can download the FirstSpot® v8 beta in our trial version page. Please check out FirstSpot® home page for the detailed product information. Please check out FirstSpot® v7 beta page for download instruction. June 3, 2009 -- We are pleased to announce that FirstSpot® v6 has completed the beta phase and will be available for public download immediately. Concurrently, we will unveil a new Premium Edition for FirstSpot® v6 that are priced between the current Standard and Advanced Edition. Designed to be price competitive, FirstSpot® Premium Edition will give more flexibility to customers who plan to deploy FirstSpot®. For details on the new v6 pricing, please visit our buy page. You can check out the latest v6 features at FirstSpot® home page. April 29, 2009 -- In development since late 2007, we are pleased to announce the immediate availability of v6 beta 1 for preview for FirstSpot® maintenance customers and FirstSpot® Official Partners. FirstSpot® v6 is the most innovative version we ever release. With unique features such as Load Balancing with Failover, In-browser message and Firstspot® API, FirstSpot® significantly raises the bar for the hotspot software market. We are confident that both hotspot owners and end-users will feel significant improvement on their hotspot experience. HONG KONG, October 18, 2007 -- After more than a year of development, we are excited to announce the immediate availability of the FirstSpot® v5 final release. Universal clients support - 2000/XP/Vista (IE5/6/7 and Firefox), PocketIE, MAC, and device without browser (via Passive Login). For more information, please visit our FirstSpot® home page at http://patronsoft.com/firstspot. HONG KONG, August 8, 2007 -- Patronsoft, the developer of the number one Windows-based Wi-Fi Hotspot Management software in the world, announces today the immediate availability of the latest FirstSpot® v5 beta to the public. FirstSpot® v5 design focus is robustness and flexibility. As with the previous version of FirstSpot®, FirstSpot® is all about giving you unprecedented control on your hotspots. FirstSpot® v5 significantly pushes the limit and we are confident that hotspot operators will enjoy the new enhancements that we bring to this new version. The new v5 pricing is also ready. Interested customers or partners can visit here for more information. HONG KONG, April 14, 2005 -- Patronsoft, the developer of the leading Wi-Fi Hotspot Management software in the market, participates in the four-day International ICT Expo event. With visitors coming from more than 130 countries and regions, the International ICT Expo is one of the premier event in the region. 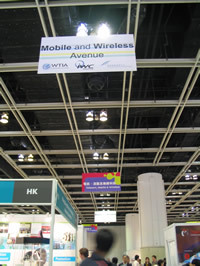 Patronsoft's booth is located in the Mobile & Wireless Avenue, which is organized by the Hong Kong Wireless Technology Industry Association (WTIA) with support from Hong Kong Government. Potential buyers and partners are all excited to preview the latest version of FirstSpot®. HONG KONG, December 8, 2004 -- PatronSoft, the developer of FirstSpot Wi-Fi Hotspot Management software, announced today the immediate availability of the highly anticipated FirstSpot v3 final release. FirstSpot v3 gives Wi-Fi Hotspot owners unprecedented control over their Wi-Fi Hotspots. As the most ambitious release ever produced by PatronSoft, there are numerous enhancements over v2. Before the final release was ready, beta versions of FirstSpot v3 had already been purchased and deployed around the world. What's more, FirstSpot was recently awarded a 5-star rating by PCWorld Magazine, a recognition of FirstSpot functionalities leadership and flexibility in managing Hotspots. As an effort to lower the initial investment for smaller scale Hotspots, PatronSoft simultaneously announced the new FirstSpot Start Edition 3.x. Priced at only US$95 per server, FirstSpot Start Edition provides an excellent "start small" path for many hotspots owners. Visit http://www.patronsoft.com/firstspot/buy_now.html for details on different FirstSpot v3 offerings. * Data Transfer tracking and Quota System - tracks data transfer usage for specific username and suspends its account when the quota is exceeded. HONG KONG, August 2, 2004 -- Patronsoft, the maker of FirstSpot, today announced that it has formed a strategic alliance with 3Com Corporation (Nasdaq: COMS) to create effortless, plug-and-play solutions for Wi-Fi-certified wireless hotspots worldwide. The prospect of new wireless hotspots, ideally suited for hotels, airport terminals, train stations, cafes and community centers, will create new opportunities for system integrators within 3Com's channel partner program and Patronsoft's FirstSpot partner program. The new wireless alliance will further expand the reach of Patronsoft's Windows-based Wi-Fi hotspot management software -- FirstSpot. Whether a customer is seeking simple authentication for a wireless hotspot or enhanced capabilities for different business models, 3Com and Patronsoft can provide tested and proven solutions. Angelo Lamme, Wireless Product Manager for 3Com Corporation: "PatronSoft's FirstSpot software is a solution that is easy to set up when customers want to build a software-based hotspot gateway on a PC platform running Windows. It is a very unique product as there are currently no other hotspot gateway products like FirstSpot on the market for Windows: The familiarity with the Windows platform for most users will result in a quick learning curve. For example, together with a 3Com Access Point 7250, FirstSpot is a very easy and cost-effective solution to quickly setup and deploy a hotspot." Alan Leung, VP Sales and Marketing for Patronsoft,"We are going to work very closely with 3Com in a global basis to provide our cost-effective and feature-rich wireless hotspot solutions to their worldwide customers." Click here to see the press release from 3Com. PatronSoft is a fast-growing Wi-Fi hotspot management software company. FirstSpot, its flagship product, is the only Windows-based wireless gateway software deployed in more than 30 countries. For further information, please visit www.patronsoft.com. HONG KONG (PrimeZone) May 28, 2004 - Patronsoft Limited today announced eleven newly appointed resellers and distributor from six countries for its Wi-Fi Hotspot Management Software - FirstSpot®. The new Silver Partners added to the FirstSpot® Partner Program are Bytes Adviser and BJ Consulting in USA; Jardine Information Technology Limited, ZX3 and Original Information Technology Limited in United Kingdom; ATD Group and T&D LAN in France; Female Technologies in Australia and Khao Yai Wireless in Thailand. The new Gold Partner, responsible for distributing FirstSpot® exclusively in Spain, is WifiSafe Spain S.L. Serving customers from more than 20 countries and seeing the country list growing every week, we are happy to see FirstSpot® fits in nicely the solution portfolios and product matrix of our worldwide partners. We also receive positive feedback from the channel on the cross-selling opportunities that FirstSpot® brings," said Karl Ma, Business Development Director of Patronsoft. Being asked if most partners are from a particular vertical sector, Ma replied, "as the Wi-Fi hotspot market does not confine to a single industry, our partners are from diverse backgrounds. To name a few, the markets our partners are serving range from the traditional telco players, WISP, Internet cafes, hospitality, resorts & clubs, universities & government, to RV (recreational vehicles) sites, media industry and even internal deployment inside medium-to-large corporations." Currently, we are in the process of finalizing agreements with several other Gold Partners in Europe and the Asia Pacific regions. By the end of this year, we expect to have a top-tier distributor (i.e. Gold Partner) in every major country. This is consistent to our plan to capture the software-based hotspot management market worldwide," added Ma. FirstSpot® Partner Program employs a two-tier structure where Gold Partners will enjoy the exclusive distribution right in their respective countries and are responsible to work closely with their local Silver Partners and customers for product fulfillment. More details can be found on http://patronsoft.com/partners/partnership_program.html. Developed by Patronsoft Limited, FirstSpot® is a wireless gateway that helps owners and operators to manage their Wi-Fi hotspots using familiar Windows platforms (Windows 2000, XP and Server 2003). For owners looking for a profitable hotspot product, FirstSpot® supports different charging schemes like post-usage billing, pre-paid cards, and online payment through credit cards. FirstSpot® supports advanced features like bandwidth throttling, SSL-enabled authentication, optional anonymous mode, language packs catered for international languages, etc. SRP for FirstSpot® starts at US$295. HONG KONG (MARKET WIRE) March 9, 2004 - Patronsoft, the maker of FirstSpot®, the Windows-based Wi-Fi hotspot management software; announced today its plan to support Intel's software-based access points in their upcoming Grantsdale and Alderwood chipsets. Running on top of Windows 2000 Professional Server, XP and Server 2003, FirstSpot® currently works with any known models of wireless access points in the market. With the coming versions of FirstSpot®, customers using Intel's software-based access points bundled with Grantsdale and Alderwood chipsets will be able to share their desktop Wi-Fi hotspots on top of familiar Windows platforms with peer computers instantly. Customers can also manage their hotspot services by using features like pre-paid airtime credits, self sign-up and PayPal integration. Given Windows is the largest OS platform that Intel CPU is serving, such support will allow anyone owning a PC with the latest chipsets to open wireless access with the least amount of additional investment on both software and hardware. Neither hard-to-learn operating system is required to kick-start a hotspot service; nor any expensive and proprietary wireless hardware is needed to expand an infrastructure. Spain, 2 February 2004 - Patronsoft Limited is pleased to announce the appointment of WifiSafe as the FirstSpot® Gold Level Partner ( http://patronsoft.com/become_a_reseller.html ) in Spain. Under the terms of the agreement, WifiSafe will become the exclusive distributor of Patronsoft's flagship product FirstSpot® Wi-Fi Hotspot Management software in Spain. WifiSafe will be responsible for the overall sales, marketing and support in the Spanish market." The initial reception of FirstSpot® from Europe is tremendous. With strong domain knowledge of WLAN and deep understanding of the local market from WifiSafe, we are excited about the value of this partnership can bring to our customers", said Alan Leung, Director of Business Development of Patronsoft. "We believe this partnership will allow WifiSafe to become the largest supplier of wireless equipment in Spain and in the future allow us to position WifiSafe as one of the most significant wireless broadband suppliers in Europe," said Francisco Menendez, Chief Executive Officer, WifiSafe Spain. "For WifiSafe it's an honor that Patronsoft has agreed to be our European partner to launch their products throughout Spain." HONGKONG (PRWEB) Feb 20, 2004 - While the telco industry is scratching the head to find a profitable model for wireless hotspots, an Internet cafe owner in Chicago is busy at expanding his already-profitable WiFi hotspot business across town. "It can be easy if you pick the right tools to save you from traps and lies", said Nick Comppen, the owner of Cyberia WiFi & Internet Cafes (located in the Wicker/ Bucktown Neighborhood). Comppen revealed the first secret; "revenue sharing models proposed by some wireless ISPs seemed a ridiculous idea since it's my high speed connection, my electricity and my employees' promotion effort. If we do all the work why would we want to give another company a huge part of our sales?" Second secret - be cautious to those hardware-based or all-in-one boxes, "they don't let me use low-priced equipments to expand my infrastructure. For simple things like adding extra access points or signal amplifiers, I would have been tied into buying their proprietary and expensive accessories forever if I had, from day one, purchased their so-called feature-rich wireless gateways to manage my visitor network", Comppen warned. For software-based solutions, a product providing proper access control and allowing customers to self-services like opening an account online and purchasing airtime by credit card is Cyberia's requirement. "Unix is hard to use to be honest, I understand it, our web servers run on Unix, but it seems that a product running on Windows is easy for the cafe staff to interface with and work with on a daily basis; without any IT person around. Also less chance of an employee accidentally messing up the system", Comppen paused. The last secret, he revealed, "make sure you can save both money and time before committing a buy - we are talking about business at the end of the day." "I discovered a Windows-based product called FirstSpot (from company Patronsoft) several months ago. It does pretty much all we need at a reasonable price. It works with any cheap WiFi gear in the market. We now make money even when our cafes are closed for the day (as we set the antenna range to cover the neighborhood). We have customers signing up online for airtime, paying through PayPal and they have never even been to our cafes." Talking about the expansion plan, Comppen said, "We plan to add another Internet cafe this summer across town, which will also be controlled by that software which supports accounts roaming - customers buying airtime from any one of our cafes can use it in other locations too"
About Patronsoft - With FirstSpot as its flagship product, Patronsoft is a WiFi hotspot management software company in Hongkong. FirstSpot - the native Windows-based hotspot management software - has been deployed around the world - from the US and Latin America, to Europe and the Middle East, and to Asia & the Oceania regions. FirstSpot runs on Windows XP, Windows 2000 Server and Professional and Windows 2003 Server. Hong Kong, 1 January 2004 - Patronsoft's flagship product - FirstSpot - was nominated for the SC Global Award 2004. FirstSpot - the only product from a Hong Kong maker receiving such nomination this year - was nominated for the Reader Trust Awards in the Best Wireless Security category. With tens of thousands of users, buyers and decision-makers around the world involved in the program, the SC Awards is a true reflection of the dynamics of the information security industry. The SC Awards brings together product developers and security technology buyers around the world and remains unchallenged as the industry's only dedicated and global information security Awards. "The nomination reflects the recognition of FirstSpot by our customers and the industry", said Karl Ma, Principal Consultant. "Wireless security sometimes means different things to commerical hotspot owners and operators. For corporate environment, wireless security may simply refer to preventing intrusion to 'internal resources'. However for WiFi hotspots, owners and operators have much more concerns over issues like access control, billing, system usability to end-users; and for sure, how to market the precious hotspot air time", said Alan Leung, Business Development Director. In addition to features like credit card support, bandwidth throttling, access minute control, etc., FirstSpot supports a high degree of customization, which gives hotspot owners and developers the greatest flexibilities to accomodate their specific needs. "We believe these all contribute to the wide acceptance of FirstSpot and its nomination for global awards", Ma added. Hong Kong, 29 November 2003 - PatronSoft was invited to demonstrate FirstSpot in the 11th "Made in Hong Kong" showcase. Organized by Hong Kong Institution of Science and The Chinese University of Hong Kong and sponsored by Hong Kong Science and Technology Parks Corporation, this showcase provided an opportunity for the local scientific community to get together and share their invention with others. For more information about the event, please click here. Hong Kong, 29 October 2003 - Since the beta release of FirstSpot WLAN access server version 2.0 a month ago, PatronSoft Limited has received more than 200 buyer requests from all over the world. The company records a 100% growth in product sales for version 2.0 compared to pre-2.0 release during the first week of product launch. FirstSpot's Win32 architecture answers the arising demand for a quick and affordable WLAN access server solution available on Windows platforms. It provides network owners an effective and secure way to manage their WLAN hostspot networks for visitors using Wi-Fi equipment to access the Internet -- simply by using a web browser. FirstSpot also allows hotspot owners to track and charge customers for online usage, by credit card or pre-payment method. One major enhancement of version 2.0 is its capability of running on top of Windows 2000 Professional and XP; which helps to save at least 40% in the total software acquisition cost for a Wi-Fi hotspot project. "Customers are clearly responding to FirstSpot's centralized and low-cost approach", said Karl Ma, Principal Consultant. "In addition to using the familiar Windows technologies, FirstSpot works with any WLAN access points found in market irrespective of their price and brands. This lowers the entry barriers for anyone who is planning for Wi-Fi hotspot implementation" Ma added. PatronSoft's existing customer-base includes US government, hotel chains, health care organization, cyber cafes, and many other public WLAN hotspot operators. "A special thank you to patrons around the world that gave valuable feedback to the 2.0 beta version. Even though we may not be able to incorporate your suggestion immediately, we consider every suggestion very seriously and we will try to include it as much as possible. Moreover, we would like to thank several customers that purchased the product even in beta stage". said Alan Leung, Business Development Director. "Your support greatly helps us to improve FirstSpot and keep the price competitive", Leung added. Hong Kong, 25 July 2003 - The 21-st Info-Security Project (http://www.infosecurityproject.com) was successfully held at the Conrad Hotel, Admiralty. Being one of the gold sponsors of the event, Patronsoft, the wireless security vendor, was invited to deliver a speech on the latest trend and development of security issues of IEEE 802.11 (aka WLAN) standards. The controversial topic - Is WLAN really Ethernet without locks? 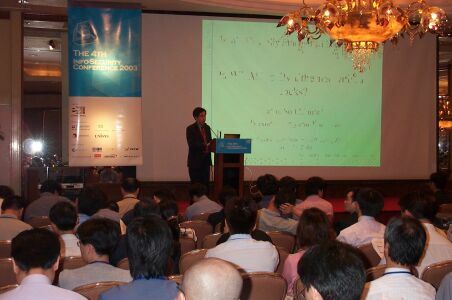 - was presented to more than two-hundred info-security practitioners, IT managers and executives attending the session. Alan Leung - founder of Patronsoft - discussed various issues found in the standards and the corresponding remedies available. A copy of the presentation slides can be downloaded from here. At the event, overwhelming interest was expressed by the attendees in the beta release of FirstSpot version 2.0. Company respresentatives from hotel chains, properties developers, WLAN ISPs and system integrators were all impressed by its orginality and technical superiority. FirstSpot - the 100%-locally-developed WLAN Access Server - is the only captive portal product available on Windows platforms. Special discount was offered on-site for the 4-th intake of the CWNA exam training class. 90% of class vancancy were filled on that same day. Popularity was due to the high-percentage of passing rate of the past participants and the unique curriculums developed by the company, based on their expertise in WLAN security and past training experience. Hong Kong, 28 June 2003 - FirstSpot Advanced Edition 1.2.2 is now immediately avaiable for release. Advanced Edition contains all features of FirstSpot Standard Edition 1.2.2 plus the support of multiple network segment. This unique feature enables network topologies containing router segregating different network segments to work seamlessly with FirstSpot. Cases that sharing a single pipe of Internet access in a MTU (Multi-Tenant Unit) environment can greatly benefit from this functionality. FirstSpot Advanced Edition is priced at US$995 per server copy; with unlimited number of users access allowed. Hong Kong, 10 June 2003 - FirstSpot version 1.2.2 is now available for immediate release. - Instant keyword - users can conveniently type logout at the Address toolbar to sign off a current version, in case the info-box has been accidentally closed. Hong Kong, 28 August 2002 - Patronsoft R&D centre has moved to a new office in Tech Centre in Kowloon Tong, Hong Kong. The Tech Centre is the property of the Hong Kong Science and Technology Parks Corporation, which is a government statutory body established to bring the world-class technology and the most highly skilled workforce together. Hong Kong, 20 May 2002 - Patronsoft was appointed as the authorised reseller for Interlink Networks' RADIUS software solutions. Interlink Networks, a leading network access management software provider, today announced agreements with several international vendors in Asia to expand its distribution channels and customer base. "Partnership with major wireless access control peripheral solution providers follows our strategic direction", said Alan Leung, Business Development Director of Patronsoft Limited. Interlink Networks' carrier-class RADIUS authentication, authorization, and accounting (AAA) software will now be resold throughout Asia by PatronSoft of Hong Kong, Compaq Japan, Datacraft Korea of South Korea, Genie Network Resource Management of Taiwan, and MicroIntelligence of China.